Thanksgiving is a holiday for the people. You watch football. You wear comfortable pants. It's hard to put on airs while scooping pees into mashed potatoes with a base of cranberry sauce and a crown of gravy. But the last trace of pretension (dignity?) left in this gluttonous holidays is probably the turkey prep: the elaborate stuffing, the ritual carving, that perfect sheen. 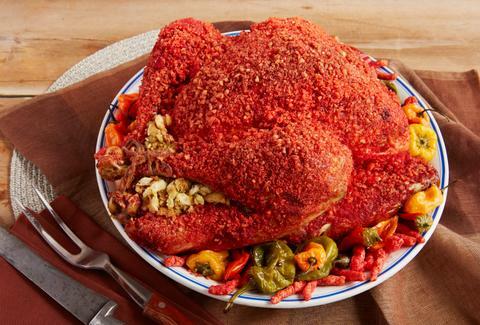 Now, however, you can finally admit to yourself what you really want and make a Flamin' Hot Cheetos turkey. This culinary innovation comes from Reynolds Kitchens, which recently posted the recipe for "hot turkey in an over bag," calling for "hot puffed cheese sticks" -- aka Flamin' Hot Cheetos, the snack of snacks. Check the Reynolds Kitchens website for the full recipe, but here's an overview. First you crush up Cheetos (a fun activity in itself) with either a food processor or a rolling pin and a zip-top bag, depending on how folksy you want to get with your Cheetos-based dinner prep. 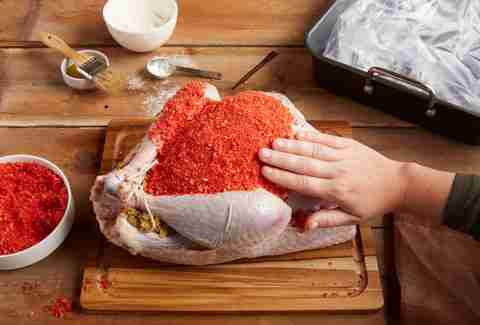 Next you oil or butter up the turkey and coat the bird in spicy orange puff matter. 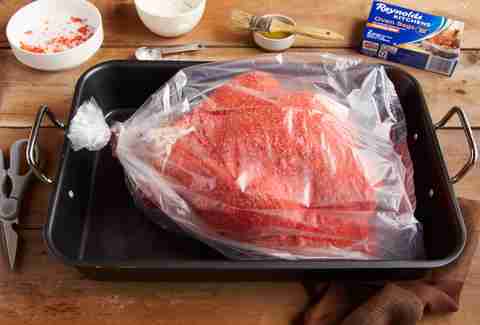 Then you put it in an oven bag and add a teaspoon of flower. After that there's a roasting pan involved and a lot of classic turkey-making stuff. If you're interested in this level of avant-garde turkey roasting, you've probably done this before, so we'll spare you the nitty-gritty and you can check out the recipe. If Martha Stewart is attending your dinner, this probably isn't the move, but we can guarantee you'll be a welcomed as a hero if you bring this to your Friendsgiving.